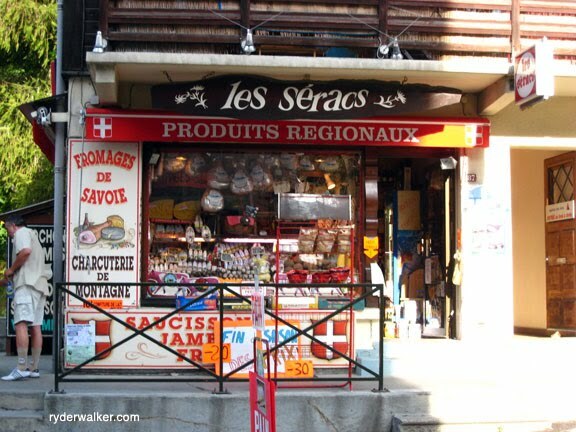 If you’re looking for locally-made artisan products from the Mont Blanc region, then look no further than the Seracs grocery store in Argentiere, France. Just a stone’s throw away from our hotel, Les Seracs offers authentic local specialties from the Haute Savoie region including meats, cheeses, wines, cookies, jams, and one my favorite drinks, genepy. Genepy is a liquor unique to the Mont Blanc region. It’s distilled from a special high alpine flower, and there are two types of this unique drink-a strong schnapps and a sweetened liqueur. Les Seracs carries both. Genepy is normally served as an after dinner digestif, but some our guests recently discovered that the sweetened version also tastes good in green tea. They were right. It’s delicious. Thus, a new tradition was born. If you find yourself on our Tour du Mont Blanc or Hiker’s Haute Route then stop into this shop. Tip: They also sell produce and breads, so it’s a great place to assemble your picnic lunch. Look for it on the main street in Argentiere. You’re sure to find something delectable.